Philadelphia 76ers center Joel Embiid practices with a protective mask before the season finale against the Milwaukee Bucks. It is quite a scene whenever Joel Embiid walks into a room, a proverbial parting of the Red Sea as people try to get out of the way of Philadelphia's enormous center. In an appearance before Philadelphia's final regular-season game against the Milwaukee Bucks on Wednesday, Embiid and his supervillain-ish mask drew even more attention than normal, as he discussed if and when he will return in the team's first-round series. From a playing perspective, his warmup routine didn't look all that different from when he's 100 percent healthy. Donning an all-black mask, Embiid took the floor a couple hours before the game and got shots up, looking comfortable and confident with the new apparel on. After getting a sweat in, Embiid joined reporters in the locker room and relayed his progression to date, which he says has been steady and positive but may not be good enough for him to suit up early in Philadelphia's first-round series. "I just got to take it day-by-day," said Embiid. "Obviously I want to play, but right now I feel like I'm not ready yet ... with the way it's been progressing, hopefully I'll be back soon. Unlikely [that I'll be back for Game 1], but there's still a chance. Just based on the way I've been feeling the past couple days and how well I've progressed, unlikely. But we're going to see how it feels." As of yet, Embiid is not being exposed to any contact, and is primarily focused on conditioning through running, work on the exercise bike, and other means of working out that don't involve contact. That sounds a little ominous this close to when the series starts, and after first sounding optimistic about his own willingness to play, Embiid tempered expectations for an early return in round one. "I think everybody knows me, and everybody knows that I love playing. If it was my decision, I would probably play. Actually, I wouldn't say that because I don't think I'm ready to play, because it still doesn't feel all the way right," said Embiid. "Like I said, it's unlikely, but you never know what can happen, maybe one of these days I'm going to wake up and it's all going to be gone. But we just got to see how it feels day-by-day." Embiid's competitive fire aside, one reason for his patient demeanor comes down to what he has seen his teammates do in his absence. With Philadelphia in the midst of a 15-game winning streak, Embiid does not feel a rush to return that he might have if they were struggling. "I think a lot also has to do with how well the team has been doing without me. Now that I know that the guys are going to go out and play and every time we step on the court be the favorite, they're kind of buying time for me to make sure I'm all the way, 100 percent," he continued. "I give them a lot of credit, they've been playing really well, and coaches have been doing a fantastic job. It just buys me more time and that's why I'm more patient about it, I know my team is going to take care of business." 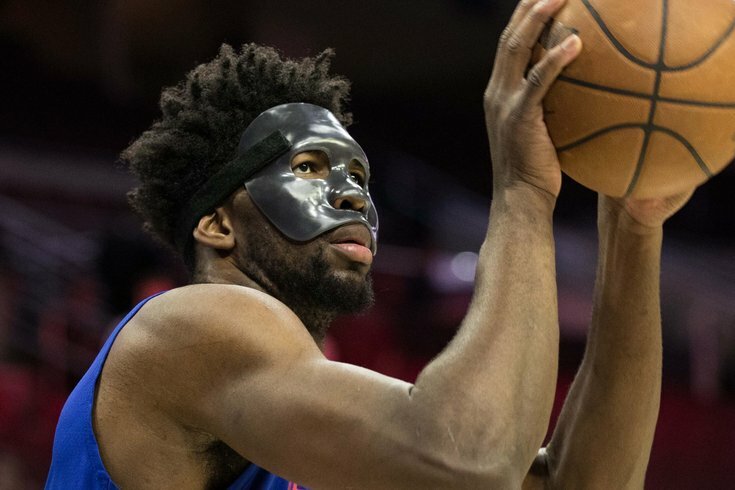 The mask Embiid has chosen is a bit of a story in itself, with most NBA fans aware that black or dark masks haven't been approved by the league in the past. Players such as Kyrie Irving and LeBron James have had to ditch them at the behest of the league, who prefer their players to rock clear masks. "I feel comfortable in it. With a clear mask, it feels like there's so much reflection and I can't really see," said Embiid. "With a black mask, it kind of gives you kind of a clear vision of everything you can see. Hopefully it gets approved and I get to play in it." Regardless of what color the mask is, Embiid's return is of massive importance to Philadelphia's playoff hopes. As well as they've played without him, the Sixers go from being pretty comfortable favorites against the lower half of the Eastern Conference playoff picture to being in a dogfight without him. Whenever the doctors and the man in the mask decide he's ready, his coach and his teammates will welcome him with open arms.